Three Quebec City mosques were the target of xenophobic messages over the weekend. 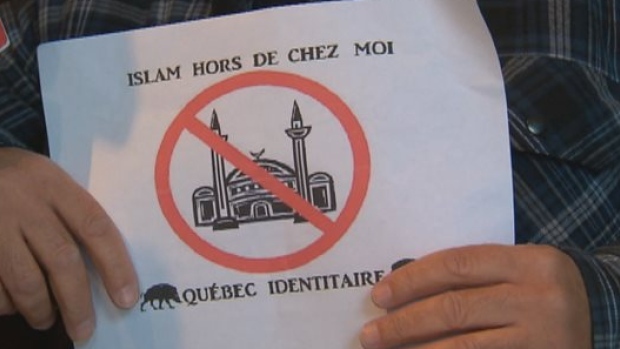 Signs reading “Islam hors de chez moi” – Islam out of my country – were posted on each of the mosques’ front doors. A mosque in the Limoilou neighbourhood, the Islamic cultural centre of Quebec City in Ste-Foy and the capital city mosque in Quebec City proper were targeted. A group named Québec Identitaire seemingly has taken credit for the posters. The group’s name was written on the posters. Khalil​ Bahji, who has been attending the Limoilou mosque since 2007, said he and his fellow congregation members are saddened by the attack. He said the members of the surrounding community are also disappointed, adding that they have been supportive in the past. We thought about moving to another place when our lease was about to end, Bahji told CBC Daybreak on Monday. He told host Mike Finnerty that a member of the community approached members of the mosque and asked why they wanted to leave and whether the neighbours had done anything to make them feel unwelcome. “This action doesn’t reflect the real opinion of the people who surround the mosque,” Bahji said. Muslim groups are disappointed that Stephen Harper hasn’t spoken out against a spike in anti-Muslim hate crimes since two separate attacks by jihadist sympathizers left two Canadian soldiers dead last week. The prime minister has not publicly uttered one word of support for Canadian Muslims following the incidents, which Harper and the RCMP have labelled acts of terrorism. He’s remained silent despite an apparent backlash against Muslims , including the defacing of a mosque in Cold Lake, Alta., racist slurs against Muslim candidates in Toronto’s municipal election and threats against the B.C. Muslim Association. 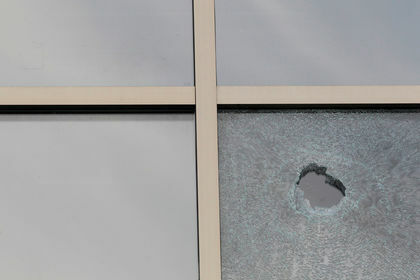 In the latest incident, windows were smashed early Friday morning at the Assunnah Muslims Association mosque in Ottawa. Mosque president Mohammed Mostefa believes the vandalism was “probably” in response to last week’s incidents: the hit-and-run murder of a soldier in Quebec and the killing of an honour guard at the National War Memorial by a gunman who then stormed the Parliament buildings. Alia Hogben, executive director of the Canadian Council of Muslim Women, said it’s “very disheartening” that Harper has not bothered to speak out against the anti-Muslim backlash. But it’s not surprising to her. “I don’t think he much likes Muslims,” Hogben said. Vice-president of the mosque Jalil Marhnouj said the vandal brought his own rocks. “When people came to pray here this morning, they saw the Ottawa police here and they saw the damage,” he said. A social experiment that ended with an actor posing as an Islamophobe getting punched in the face has shown that Canadians are prepared to defend Muslims in the face of overt racist abuse in the wake of a recent terror attack. In an attempt to test whether Canadians feel safe in the presence of Muslims following the fatal shooting of Corporal Nathan Cirillo by an Islamic extremist last week, director Omar Al-Bach conducted the experiment in Cirillo’s home town of Hamilton to see how many people would defend a supposed Muslim from verbal abuse. At the start of the video, Al-Bach introduces two actors, “Devin” as an outspoken racist and “Zack” dressed in a traditional Islamic kaftan with a white cap. The video shows members of the public standing up for the victim – with one even prepared to punch the racist in the face after Devin accuses Zack of being a potential terrorist because of the way he looks. Since it was uploaded 24 hours ago, the video has garnered nearly 300,000 views and the filmmakers went on Canadian channel Global TV yesterday to talk about their social experiment. 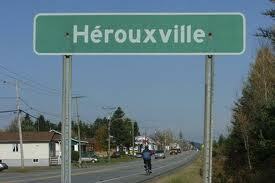 One of the authors of Hérouxville’s infamous code of conduct in 2007 is calling for all mosques across the country to be closed temporarily, in reaction to the killings of two Canadian Forces members in separate incidents in Ottawa and St-Jean-sur-Richelieu last week. 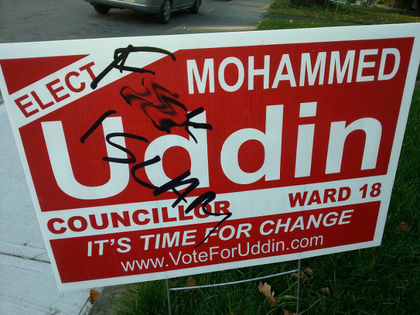 In Ward 18, council candidate Mohammad Uddin claims he has been the target of a steady stream of Islamophobic insults. On Thursday, he tweeted a photo of one of his campaign signs defaced with the words “F— Islam.” Uddin claims racist graffiti has been discovered outside his campaign office as recently as Friday, and earlier this month, he says his car windows were smashed and his campaign signs were stolen as the vehicle sat in his driveway. 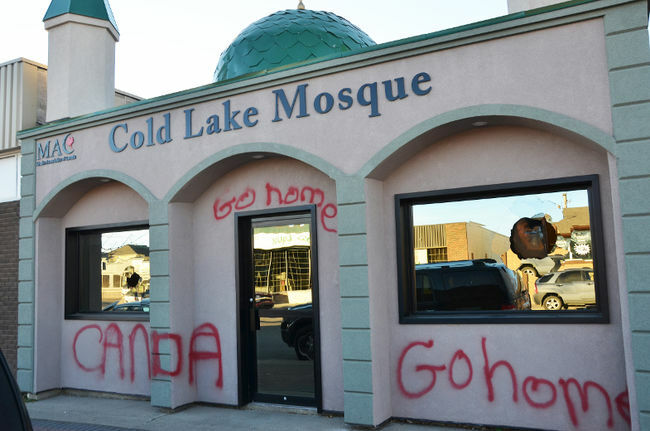 The Cold Lake Mosque was vandalized overnight in what local business owners and residents are calling a “disgusting” crime. RCMP Sgt. Troy Hadland said police responded to a call of mischief at 6:30 a.m. Both front windows were broken and the words “go home” and “Canada” were spray painted with red paint on the outside of the building. Hadland said evidence at the scene was seized and sent to St. Paul RCMP for analysis. “This type of behaviour won’t be tolerated,” he stressed. A steady stream of business leaders came in through the front door of the mosque offering their support. They described the crime as “disgusting” and assured mosque members that this crime does not reflect the view of the community of Cold Lake. The mosque has been gathering posters, flowers and gifts from the community and displaying them by the windows that were smashed. One of the posters reads “you are home.” A pen has been left by the poster and people have been signing their names. On Friday night, Ward 2 city council candidate Munira Abukar got a phone call from a supporter saying that some of her campaign signs had been kicked over and it looked like they had been vandalized. The signs were found on the corner of Martin Grove and Dixon Rds. in Etobicoke. At about 2:30 p.m. Sunday, Abukar reported the incident to the police.